The DelGrosso Amusement Park's Family will do all they can to keep you entertained with their annual family events, good food, and casual atmosphere. Relax and enjoy your summer days at a Pennsylvania Amusement Park. You can expect traditional and unique Family PA Attractions all summer long. From Mothers Day through their Harvest Festival DelGrosso Park will enchant you with their interactive family events. Most popular for their fourth of July celebrations known as Summer Thunder,and fantastic authentic Italian food. Speaking of loving authentic Italian food, plan on attending DelGrosso Park's annual Italian Festival. One day in September is set aside to celebrate the communities heritage. It's called "The Italian Food and Heritage Festival." From the new Sauce Island to the original DelGrosso Amusement Park you will find plenty of activities to keep your family entertained throughout the day. On Sauce Island you can enjoy the DelGrosso Water Park, with huge slides and beautifully kept grounds surrounding the pool. They supply the lounge chairs, umbrellas, and innertubes. All you have to do is bring your swimsuit, towels, and tanning lotion. Do you have a family member that has a need for speed? Let them take a few spins on the Speedway Go-Karts and Speedway Naskarts. Treat your family to a round of golf at their Championship Miniature Golf course? When you need to take a break from all that playing you can enjoy some delicious ice cream at Gardner's Candy. They make delicious hand-made chocolate candy, right down the road, in Tyrone, PA.
My favorite stop is the famous Texas Hot Dogs. Order your hot dogs with everything on them and you'll be in for a really big treat. Their sauce is a family secret recipe that has been loved in our area for generations. There is actually a legend to that sauce recipe. DelGrosso Park offers exciting events like, the Native American Pow Wow. This is one of my family's favorite summer events among all the Pennsylvania Amusement Park activities. Admission and parking is always free, except for the Fall Harvestfest. It is the only time you will be charged admission into the park and it's only a couple of dollars. You'll find it's well worth the admission. During the summer months you can save some money by buying a jar of DelGrosso Sauce. Not only is the sauce a delicious bargain, you'll also find a coupon for their all day ride pass. There is always something for everyone in your family to enjoy. Your entire family will feel safe, welcome and part of the DelGrosso family. Throughout the Allegheny Mountains people still refer to DelGrosso Amusement Park as Blands Park. The history of family PA Attractions and friendly atmosphere has made this a favorite Pennsylvania Amusement Park for generations. The DelGrosso family has owned and operated the park since 1946, but they kept the name Bland until 2000. The park was originally a farm, owned by Fred Bland. He just had a few simple rides and picnic tables. It became a popular Family PA Attraction in the early 1900's. Railroader Fred DelGrosso and his wife Mafalda bought the park and made a very special family business out of it. 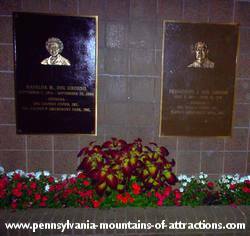 Even though Fred and his wife are gone now, their close knit family still operate the Pennsylvania Amusement Park and continue to expand and upgrade the park on a yearly bases. They still keep it simple and clean with old fashioned country charm. I have known the DelGrosso family as long as I can remember. My dad was a business man in the Altoona, PA area and was good friends with Fred DelGrosso. The popular DelGrosso Sauce is the original recipes of Mafalda, also known as Murf. The famous DelGrosso Sauce was her family recipe. The foods sold at the park are also Murf's recipes. Murf's potato salad is the most popular. 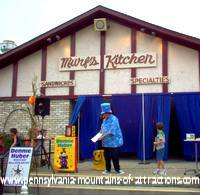 That is why this Pennsylvania Amusement Park's Refreshment Stand is called, Murf's Kitchen. If you want a real treat, visit DelGrosso Park on Spaghetti Wednesday Beginning the first Wednesday in June through August. You'll find dishes like Homemade Lasagna, Stuffed Shells, Gnocchi and Meatballs, Chicken with Penne Pasta and Alfrado Sauce. Every September Delgrosso Amusement Park sets aside a Sunday for the Italian Food and Heritage Festival. Fall in Pennsylvania wouldn't be complete without enjoying DelGrosso Amusement Parks Harvestfest . It's always an annual PA event the third week in September. Without a doubt it's one of my favorite PA Fall Festivals. Many families from the Allegheny Mountains visit DelGrosso Amusement Park to enjoy an Italian dinner on a hot summer evening. Their Pizza and Hoagies are worth the trip alone. Experience a relaxing old-fashioned Amusement Ride on the DelGrosso Amusement Park Award Winning Carousel. Each Hand-Carved Horse is also hand-painted. Bring along a comfortable lawn chair and enjoy one of DelGrosso Amusement Parks free summer concerts. They try to please all ages with their monthly concerts. You'll enjoy Country Music, Jazz, Rock n Roll, and even authentic Italian music. Many of their concerts have top name artist, like Lee Greenwood, The Fifth Dimension and Air Supply. Below is a link to the DelGrosso Amusement Park schedule. I hope you find the time this year to visit our area and see how nice it is to be treated like part of the DelGrosso family. Visit all the Pennsylvania Amusement Parks, you will see how unique and entertaining you summer could be every year.